Analytical, Rational, Innovative & Creative. Our team at Mountain Laurel Digital is all about true partnerships, a love of collaboration, and the awesome ferocity in our combined skill sets. We create strategies contextualized by data and focus on the humans, relationships, and experiences supporting the rich and thriving online presences of the businesses we serve. Casey’s knowledge of SEO, technical marketing, branding and digital strategy spans back to 2010 as search marketing started to take over the marketing dollars of businesses around the globe. Through her start-up and agency career, she discovered a new way of optimizing online content, by paying attention to the people driving consumer choices. This humanized search intent research is what makes all the difference to how we approach marketing and why Mountain Laurel Digital was founded. Caitlin Campbell is a writer and content creator with a love for mission-driven and arts-focused brands. She attended NYU and has worked as a writer and marketing professional since 2007. Throughout her career, she’s successfully built and bolstered a broad range of brands as a self-employed entrepreneur, communications expert for nonprofit organizations, and brand developer at creative agencies. She knows that great messaging can change the world, and her love of language and psychology propel her passion for creating high quality and innovative marketing strategies. Kelli Early thrives by bringing content and technical SEO together for a perfect marketing marriage. With a degree in Business Management from UNC Asheville and years of non-profit advocacy experience, Kelli realized a love for intent-driven marketing supported by data & strong relationships. Through her work with creative campaigns, Kelli realized that being data-focused doesn’t have to be exclusionary, but rather a catalyst for brand clarity. When she is not hiking with her dog Duke, Kelli is supporting clients with website updates to bring their vision to life. Lauren Toews is social media marketer and content creator who is dedicated to producing authentic storytelling, unique imagery and true connections through the world of social media. She graduated from Belmont University with a degree in Entertainment Industry Studies before starting her career in Artist Management. Through working with musicians and helping them to craft their story in the digital space, Lauren realized that she wanted to dive deeper into social media and has been working with a variety of businesses and brands ever since. Karolina Drozdz is our paid search partner. She started her online marketing career 4 years ago when she moved to Stockholm from Poland, her home country, and has been working ever since with Google Ads and paid social media, handling campaigns for companies of all sizes in various European markets, as well as assisting clients on more strategic levels. She has extensive international experience, having lived and worked in 5 countries, and speaks 4 languages. Her passion for online marketing shows in a constant desire to learn more and develop. Words complacency and bored do not exist in her dictionary. She values transparency and honesty. She thrives most when she can support brands that act in line with her values and have a positive impact on the world around them. 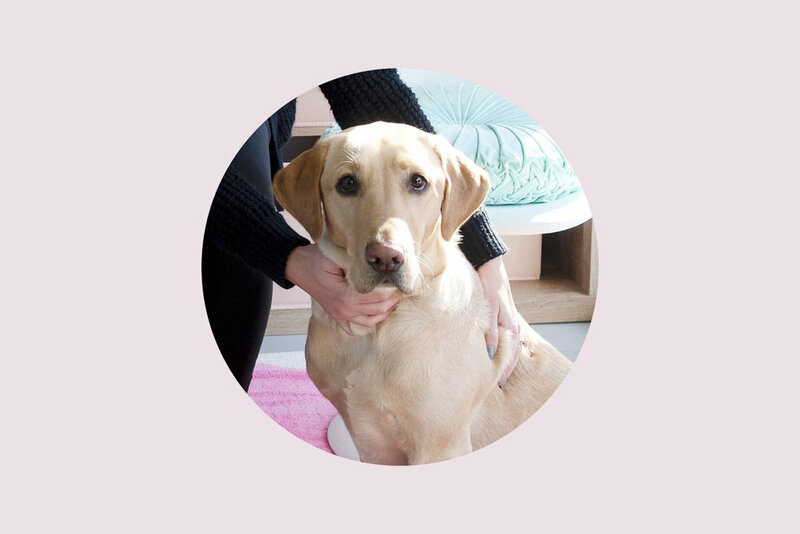 Cooper is our studio companion (and de facto mascot) and can be found laying by a fire, expectantly looking up at you ready to give love, or simply laying his head on your knee - complete just knowing you are with him and he is with you. He is the constant companion and provides loyal support to of us in Studio 44 as only a sweet, squishy, yellow pup can. We're so thankful to be able to have such a lovable little guy roaming our creative space and offering those supportive moments in collaboration. Mountain Laurel Digital provides marketing partnership with a focus on SEO, research, online brand strategy, and content initiatives for clients spanning the speciality food and beverage, retail, wellness, visual media, e-commerce, software for service, tourism, and higher education industries. Our partnerships bring clarity, guidance, awareness, and interest to our clients’ marketing efforts.